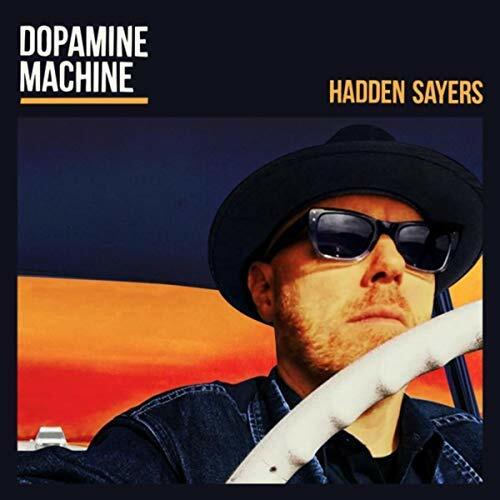 I just had the opportunity to review the most recent release, Dopamine Machine, from Hadden Sayers and it's strong. Opening with power rocker, Unsatisfied, Hadden Sayers on lead guitar and vocals, shows a take no prisoners attitude, backed by Greg Morrow and Rusty McFarland on bass. Fat, grinding guitar riffs and a driving bottom give this track real impact. With a pop edge but a raw delivery, I Feel Love has one of those "I know this track" feelings. With that slapping cowbell and raw energy, it continues a terrific rocking attack. With a cool Texas like swagger and double stopped and slide soloing guitar work, Hit The Road, would certainly get the RBF Gibbons seal of approval. The first ballad style track, Blood Red Coupe DeVille, is actually really terrific. I can see it as a sneak radio track with strong appeal to music heads as well as pop audience. Another pop rocker, Good Good Girl has a light beat and with falsetto singing, this track reminds me a bit of the Eagle of Death Metal, a super pop rock trio. Sayers winds his guitar out a bit here on a short string with great contrast but keeps it a contained pop rocker. With a heavy hammer, Peppermint Patty is another hot pop rocker with a tight riff, distorted vocals and a great bottom. Excellent! Wrapping the release is Backbreaker, a hard driving rocker, with lead drums and a rolling guitar riff. Sayers' vocals are consistently solid throughout the release with power to spare. One of the best rockers I've heard in quite some time.